I’m pleased to announce that 2014 is going to get off the ground with a bang! 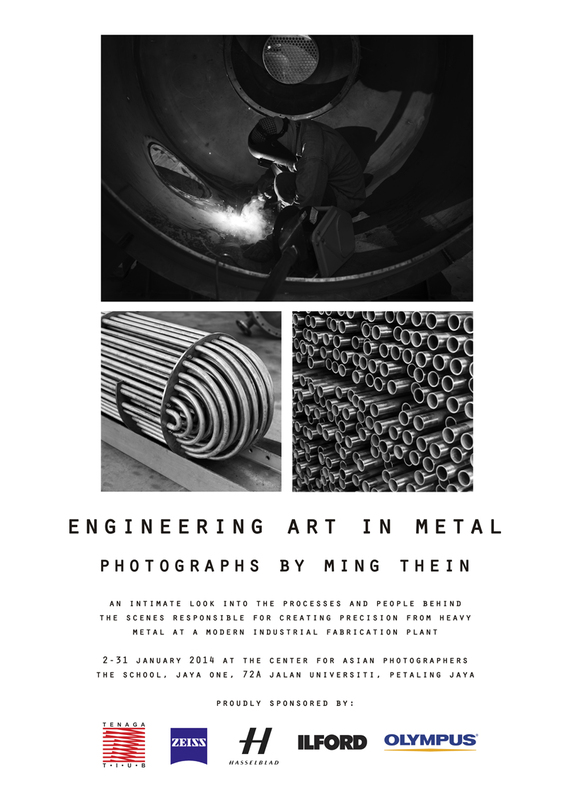 My third solo exhibition, Engineering Art In Metal, will run from 2-31 January 2014 at The Center For Asian Photographers in Kuala Lumpur. Click on for details. Taking the best of the images from the assignment (photoessays here and here), a collective decision was made with my client to exhibit these as large prints for the public to enjoy; the prints will then go to grace the walls of their offices. The images celebrate finding beauty in the details. A large amount of knowledge and expertise is required to create the core components of a heat exchanger or process vessel that can withstand high temperature, pressure and chemical attack; even something seemingly as simple as bending a pipe is not straightforward: too aggressive a radius and the metal may become thin, weakening the structure, or the cross-section flattened, reducing efficiency and impeding fluid flow. Similarly, photography done in the right way holds the potential to allow us to explore a world we do not normally get to see, or to experience a familiar world in a unique way. At this point, I would like to thank the main sponsors of this exhibition: Tenaga Tiub, my primary sponsor and client; Hasselblad, Zeiss and Ilford, represented by Shriro Malaysia; and Olympus Malaysia. Engineering Art in Metal runs from 2-31 January at The Centre for Asian Photographers, Level 1, The School, Jaya One, 72A Jalan Universiti, Petaling Jaya, Malaysia. Google maps directions are here. The list of sponsors is telling. Their products got rave reviews on this blog. Actually, no, it isn’t. I declined to review the Lunar and didn’t like the H4D. I also shoot Fuji film. So perhaps you should check your facts before making thinly veiled and amateurish accusations. The client paid for the prints. The camera companies paid for the event. This site, and I, have no sponsorship whatsoever. Well what a day – the photos are just simply mind boggling – absolutely nothing on screen can match the quality of the prints. Makes me want to print even more. Your print master is one of a kind as well. I saw the print on canvas and was completely blown away – tack sharp – none of that cheap dented canvas stuff sold all across the world. I’m definitely going to use Weslie for some of my prints. Thanks for taking the time to talk to me Ming – I really appreciated your warm personality and your love of photography is so apparent its quite contagious. I for one dont regret the 400k trip from Malaka to see the exhibition. well done and best of luck for the future – I’m sure it is bright for you. p.s. – A new doco on Vivian Maiers is hitting cinemas soon. I know you are not much of movies or TV man but this might tempt you. Thanks for coming down – glad you enjoyed it! I will be making a trip up north this weekend to check out your work. You still doing the gathering/ Q&A session this weekend – if yes what time ? Didnt had much time to explore around Malaysia yet due to work commitments – but is Putrajaya a good place for architectural photography ? Also do you buy any of gear from KL or Malaysia. Some of the stuff from Amazon will not be shipped worldwide. The photos of this series are incredible. There’s an Olympus session happening this Saturday 11th at 1.30; the general Q&A/ Zeiss session is next Saturday 18th at 2pm. Putrajaya is not bad but a bit soulless. I do get gear locally, try YL Camera at Pudu Plaza. Congratulations Ming, nice to see you taking this big step. I can’t make the Q&A, but I hope you could answer these questions, even after the Q&A session. I saw your time lapse video on YouTube and saw the framed pictures. How did you choose the frames, is this a process for every photo separately, or as most are the same size you just stick to a “standard” frame? I like to get my own work printed some day on a big print but I always feel in the deep on this. Do you have any good sources on this topic or are you making a video/blog on printing and framing in the future? I like simple frames: one that don’t detract from the image. The images are actually first mounted to a rigid board, then set flush inside the outer frame with no glass; this is so you can still appreciate the texture of the baryta paper. I did do one article on printing, here. Haven’t covered print workflow yet, but I don’t do anything different for pre-print prep other than trial calibration to the specific paper/printer combo – my workflow will put out files that are pretty much ready to go. Congrats Ming, this set is one of my favorites! I love the light captured in that one along with fine detail and texture. Wish I could be there to see the exhibition. Congratulations, I will be there surely. Congratulations Ming! I wish I could be there to see it. How well does the E-M5 hold up in a 32×32-inch print? It must be pretty decent if you’re showing the print. Wow. Now I need to go trawl your Flickr feed to figure out which one that is! And I really wish I could see the prints in person now. Another question: what does the Sihl Baryta give you that other papers don’t: resolution, tonality, something else? It seems that print is more forgiving in some ways and very demanding in other ways, based on my limited experience with it. Well said: print is very demanding of color, tonality and getting your print calibration correct; it isn’t so demanding of resolution. What shows is not so much a lack of resolution but digital artefacts – pixellation isn’t obvious, jaggies and oversharpening haloes are. Great work! Best of luck with the show Ming. Congratulations Ming and best of luck! Congrats on the show, the collection was very much deserving of a show by itself. Won’t be around to experience it, unfortunately, but will definitely try to be there for the second show. I have enjoyed seeing images from this collection every time they have appeared in your many articles. Perfectly printed and in person must be breath taking! Simply elegant! Congratulations! congrats – unfortunately I will not be in asia first quarter of 2014, otherwise I would have stopped by! Thoroughly deserved – a nice way to start a new year. I think you mean 2014. Hope it goes well. So very cool, wish I could be there to experience everything in person. Um wow and congrats mate. That definitely start 2014 with a big bang! What impresses me most is you’ve been able to print them pretty much the way you would want them to be printed, how many in total? Are all the images from the Hasselblad? At that size they will be brilliant!!! 32 in total. Yes, printed as I’d want in an ideal world – I just did the final QC/ signing today before mounting; they’re absolutely stunning. Images are a mix of Hasselblad, E-M5 and there are a couple of D800E with Zeiss in there.